Beach bums and sun seekers come to Phuket for, obviously, the beaches, but there’s much more to Phuket than that. The largest island in Thailand is a total package. Blue sea and white sand aside, the southern city boasts rich cultural heritages. From vibrant Sino-Portuguese buildings and street arts to beautiful Thai temples and Chinese shrines, Phuket will also charm history buffs and art lovers. With something for everyone, don’t forget to put it on your itinerary. Now let’s see what Phuket has to offer. So everyone knows Patong Beach, but how about you escape to other beautiful beaches with much less crowds? 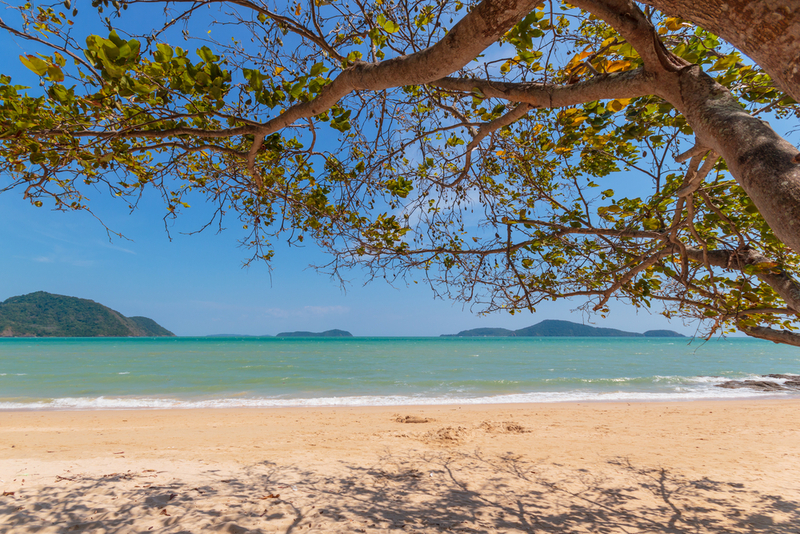 At Kata Beach, Karon Beach and Nai Harn Beach, for example, you can sunbathe and swim in peace and quiet. If you love diving, the small islands around Phuket aren’t to be underestimated. Hop on a boat and head to Racha Islands for an underwater world full of fish. If you don’t want to dive but still want to get close to the fish, visit Coral Island (Koh Racha), where the fish are so close to the shore that you can swim with them without diving. Book a Phuket Beach and Other Highlight Tour. As the saying goes, old is gold. The historic area is home to rows of century-old Sino-Portuguese shophouses. Many of them are transformed into museums, restaurants and cafés. Isn’t it cool how you can actually go inside and soak up the retro atmosphere? But the newer stuff in Phuket Old Town are also worth seeing. 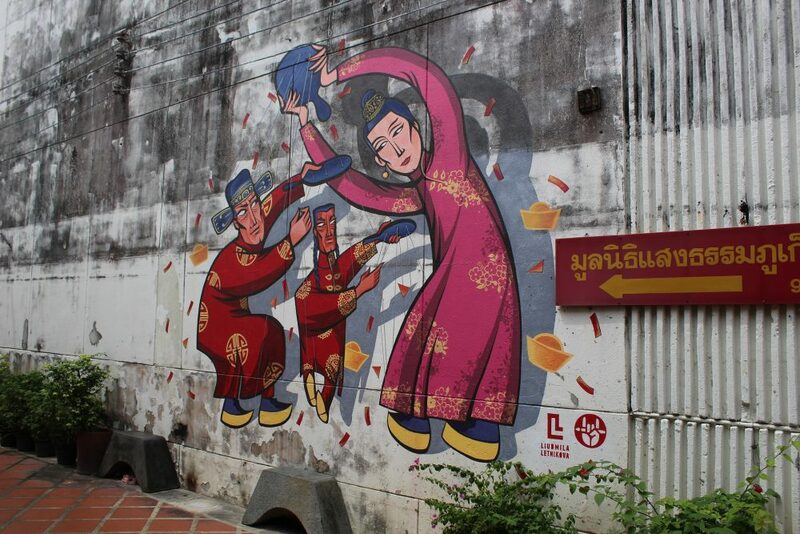 As you stroll in the old town area, be sure to keep an eye out for street arts. They aren’t just there looking pretty; they also tell you about the local ways of life in Phuket. Book a Phuket Old Town Walking Tour. 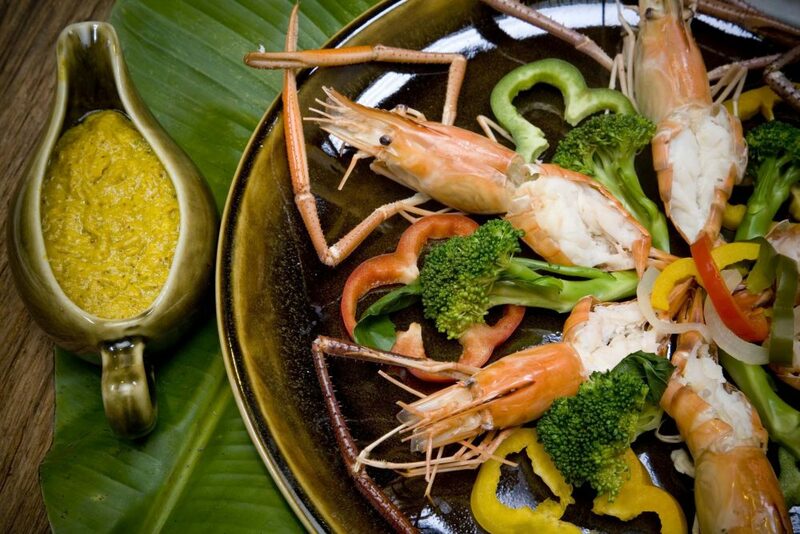 It wouldn’t be a stretch to call Phuket a foodie paradise. Not just in the south but in all of Thailand. Phuket soul food is very flavorful thanks to the blend of cultures. With the island’s Chinese heritage, you’ll get to taste some of the best noodles and dim sum in the country. Go to a kopi shop (Southern Thai for coffee shop) for dim sum as well as southern-style coffee. Also make sure you try roti. Apart from local food, Phuket is packed with top-notch restaurants serving up oceanfresh seafood and international cuisine. You can eat all day if you want to! Book a Phuket Gastronomy Tour with Best Viewpoint, Wat Chalong Visit and Thai Massage. 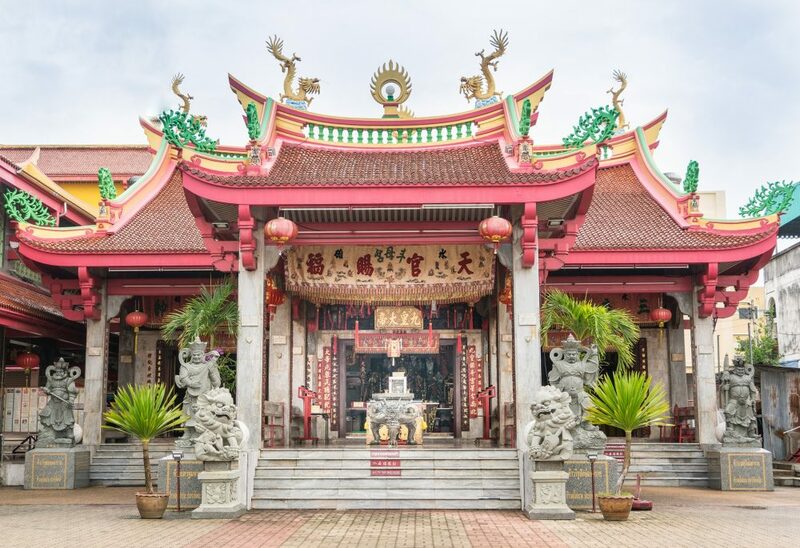 When in Phuket, you have to see both Thai temples and Chinese shrines. Wat Chalong (Chalong Temple) features elaborate architecture building. It’s one of the most famous Buddhist temples in Southern Thailand and Thais visit the temple to pay respect to Luang Phor Chaem. Then there’s Wat Phra Thong or Wat Phra Phud. The golden Buddha image is half-buried, looking as if it’s protruding from the ground. You can visit Chinese shrines in Phuket every day, but if you come in October, you’ll get to join one of Thailand’s biggest Vegetarian Festivals at Jui Tui Shrine. Chinese New Year in Phuket is as magnificent, so February is another great month to visit. Book a Phuket Temple and Shrine Tour. 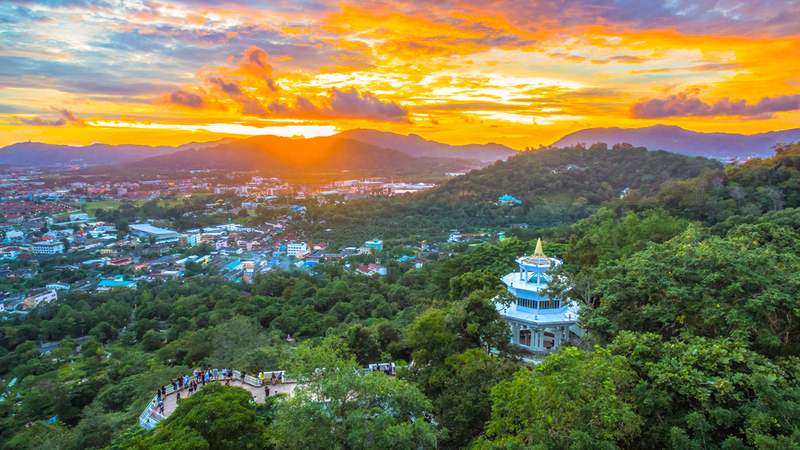 Phuket has so many viewpoints that it’s possible to go viewpoint-hopping. You get to take in both seascape and cityscape, but each one has its own specialty in addition to the view. On Khao Rang Hill, you can enjoy a meal with a view at a restaurant. From Karon Viewpoint, you can see three beaches at once. If you go to Khao Toh Sae Viewpoint, you’ll meet the monkeys. Go up Nakkerd Hill and you’ll see not only the view but also a giant Buddha. Book a Phuket Nature and Local Culture Tour. There are lots of sunset spots in Thailand, but among them, Phuket is voted the best place. Where to? Promthep Cape, of course. 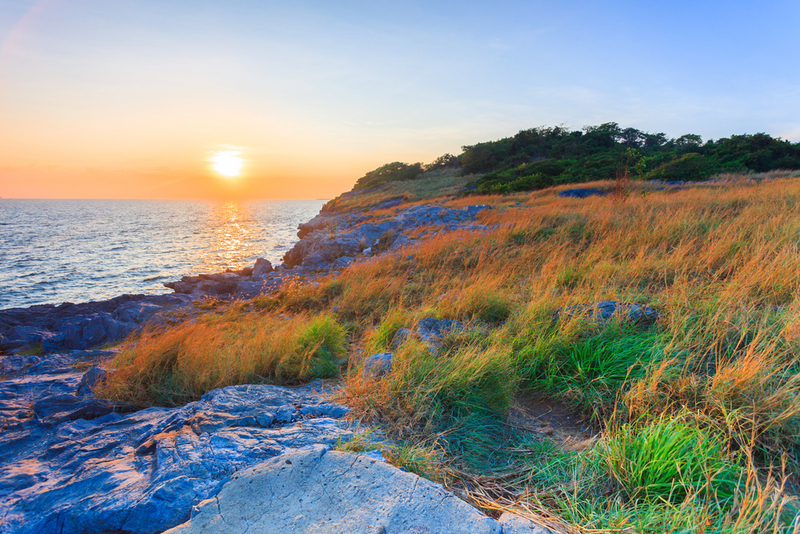 Make sure you go before the sunset time, though, so you can visit the iconic lighthouse with exhibitions on royal ships. But if you want an alternative, Windmill Viewpoint is as stunning and there are fewer people around. Perfect for couples or those who love solitude. Book a Phuket Highlight Tour. Don’t fall asleep yet! When talking about Phuket nightlife, Bangla Road (Soi Bangla) near Patong Beach will definitely come up. It’s the party hotspot in Phuket. But if you aren’t a party animal, save your Sunday night for Phuket Walking Street or locally known as Lardyai (Big Market). 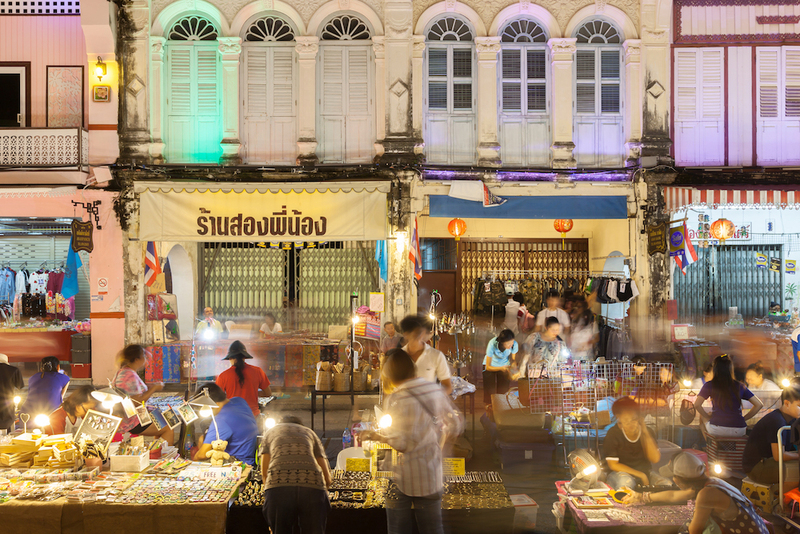 Stretching along the historic lane of Thalang Road in Phuket Old Town, Lardyai is a feast for the senses with mouthwatering local food, beautiful (and even wacky) handicraft and live music. The facades of the Sino-Portuguese shophouses are also lit up. Book a Phuket Top Attraction Tour by Motorcycle.